Barry McGee has become an icon in the realm street art and its associated subcultures of skateboarding to graffiti. His style is a hybrid, incorporating refined typefaces, boldly colored geometric patterns, and eccentric characters. The San Francisco-based artist is having a busy summer, exhibiting in back-to-back exhibitions: a showcase of new work that opened at PRISM Gallery in Los Angeles in May, while a comprehensive retrospective of the artist's career to date kicks off August 24 at the Berkeley Art Museum and Pacific Film Archive in Berkeley, California, curated by Lawrence Rinder. Recently, ARTINFO reached out to the artist and asked him about his career, making work indoors, and where he gets inspiration. Your Prism Gallery show incorporates all new work... How did you approach the project? Yes, it is mainly all new work that I have been working on over the last year or so. Prism has an interesting layout. The space had been recently reconfigured and refined even further since the George Condo show. I came to the space with everything I had: scraps of paper, photo collages, rocks, and several boxes of debris from my studio. I have this problem of trying to put everything I have ever made in each exhibition, and this show was no departure. It's kind of a "Summer of McGee" -- you're also about to be canonized with a retrospective at the UC Berkeley art museum. How did that show come about? Oh dear... well, yes. Something is happening there. It's one of the most challenging spaces I've encountered. In the Brutalist tradition, it is a poured concrete spectacle. Every notion I've had for the show has been challenged by how to install into the concrete walls. Factor in some of my terrible pieces that I conceived decades ago and you have the making for disaster. Larry Rinder, who I absolutely adore, came up with the idea. The Berkeley show charts the course of your career. How would you describe your evolution? I never really had the notion of a career when I first ventured out onto the streets with some friends. It always felt more pure, spontaneous, and exciting than anything that could happen in a controlled white room in a gallery. I still feel the same way to this day. The exhibition charts some of the pieces and ephemera that made it through that period. I'm trying to make it interesting in a kind of linear flowing way, but with some new configurations when it becomes too predictable. The Prism and Berkeley shows offer a nice contrast. Many artists hate having a retrospective because they feel that it means that their work is a part of the past. Do you find yourself consciously striking out in new directions with shows like the Prism exhibition? In all honesty, I myself am curious how it will all look together. There are pieces that I have not seen for over 20 years, and works that I just assumed had vaporized or somehow disintegrated. There are also many pieces I wish would just disappear once and for all. I will certainly have a better grasp of all this at the end of August. What have been the main differences for you between planning shows for indoor spaces, like Prism and Berkeley, and working in the street? Work done illegally outdoors or without permission feels like pure freedom to me. I understand how it can upset many in our society, but in the bigger picture it is ultimately about freedom. We are living in a time where public space has become a commodity for corporations to control and dictate what is seen and heard. A large amount of time has been spent assuring the museum that I can restore it to a normal state, even though it is slated to be torn down soon. How do you prepare for large-scale exhibitions, especially ones with large installation components? Is there a lot of preparation beforehand, or does it come together in the space? That is a great question. I'm not sure how it happens. Great things happen in the 15 minutes before every opening. I want the show to feel spontaneous and on the verge of chaos when the bands start playing. Where do you find the inspiration these days? 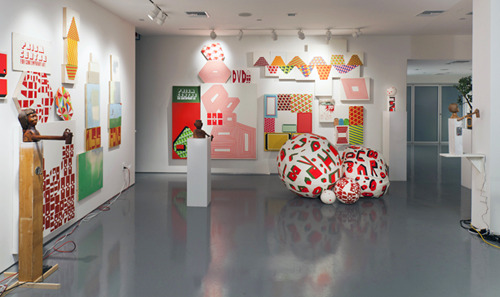 To see artwork from Barry McGee's PRISM Gallery exhibition click the slide show. Can the Bronx's Radiant Via Verde Housing Complex Revive Socially Conscious Architecture? Like what you see? Sign up for BLOUIN ARTINFO's daily newsletter to get the latest on the market, emerging artists, auctions, galleries, museums, and more.